Wow, there have been some great Christmas decorations throughout blog land. So much inspiration and speaking of inspiration we had a bunch of it at last week's party. Here are a few features. I was thrilled that Yvonne shared her renovated kitchen. You must check it out. Karen at Shabby Sweet Cottage shares how she transformed Dollar store ornaments into these beauties. Brown Paper Packages shares the tutorial for this candy striped wreath. Cute ruffled tree pillow at Girl in Pink. Beautiful dining room reveal at Life at Lydia's House. 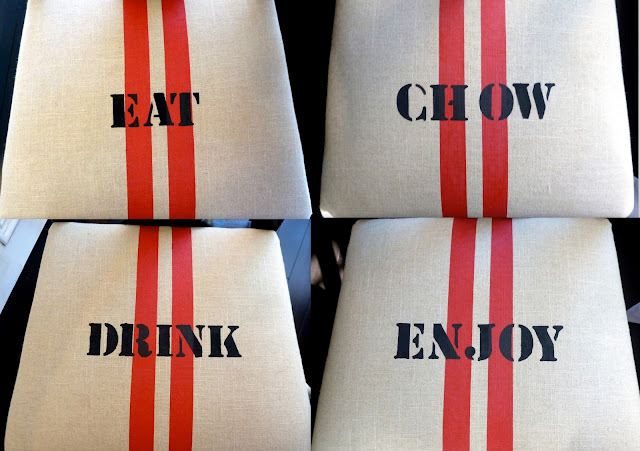 Carmel at Our Fifth House shares how she transformed her chair cushions. Love this Ballard's knockoff advent pillow by Home Made. This one is cuter. 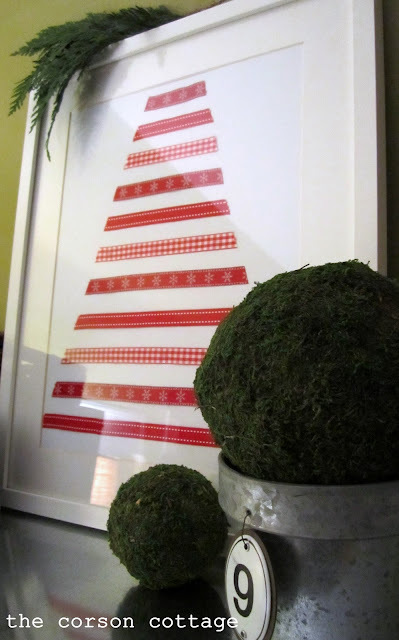 The Corson Cottage made this very cute Christmas tree art. I am not having a specific Christmas themed party because you can link up anything here including your Christmas or holiday decor, recipes, crafts, home tours, etc. I just ask that you have a link back in your post . Please link no more than three posts. If you are new here I hope you will follow. I've been catching up with your posts, Kim! Gorgeous Christmas at your house! Great features Kim! Great ideas too. Thanks for hosting! Thanks for hosting Kim, loved your features! Carmel chairs still make me giddy! Great features! I love that beautiful kitchen. Thanks for hosting! Hi Kim, Thanks for hosting and sharing all this wonderful inspiration. love the Advent pillow! Thanks for hosting such a great party. And you Winter White bedroom is gorgeous. Ah, when you get tired of the dresser in the room, you could pass it this way! Lovely features. Thank you for stopping by my blog today and also for inviting me over to your party... :) I just linked up the DIY Winter Hair Tutorial... Your features are Lovely ones...Those Dollar Store Ornament Transformations are Beautiful... And Certainly worth MORE than a Dollar Now!! I hope you have a Lovely week!! And thank you again. There really has been just a mind boggling amount of wonderful inspiration out there. Thanks so much for bringing so much of it to us through your party, Kim. You already visited my post! I appreciate you coming by and giving me feedback! Great features! Everyone is so unique and amazing. Thanks for hosting Kim! Really love the ruffled pillow and the chair seats. Thanks for hosting, Kim! Aww Kim thanks for the feature, I'm not feeling well but this really brightened my day. All of the features are so great I'm thrilled to be in their company. Thanks again. I love that kitchen in the features - everything you featured is beautiful! There sure is a lot of inspiration out there! Thanx for hosting such a fab party Kim! Great features Kim.looks like you have some great ideas. Thanks so much for hosting your lovey linky party. Kim, great ideas! I love the Christmas tree pillow. Thanks for stopping by! Glad I have something to link up this week!! Thanks so much, as ever for hosting Kim. Loved your Christmas vignette in the box this morning. Glad you did an extra post. Isn't Christmas fun. Blogging sure is making it more so for me!!!!! What gorgeous features! Thank you so much for hosting! Sorry I'm so stinkin' late...but I made it! I went shopping after school and just got home a little while ago. I loved all the features and hope to have time to visit links this weekend. Thanks for hosting! Kim- I swear this thing gets better every week. The problem for me is not enough time to visit all the blogs that I would like. I think it is wonderful that you pick a few to feature because then we can go right there and not have to scroll through and try to decide WHAT to see in a limited amount of time. 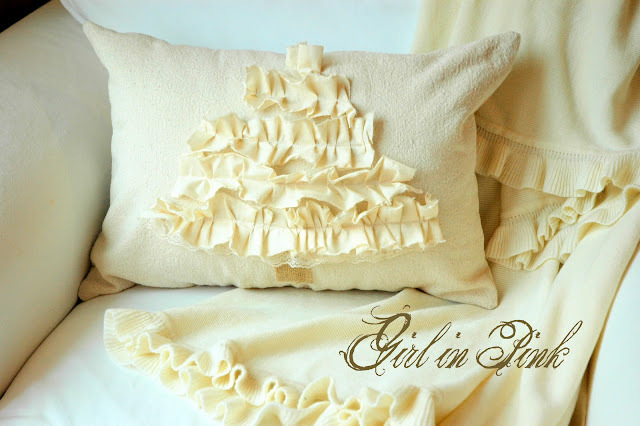 The cream color pillows are adorable! Thanks for hosting! Thanks for hosting! My first time to join in on the fun! Love those chairs you featured! Linking a few tonight - been a busy time of year! Happy to be joining you this week. I hope you enjoy my post on creating four very special aprons. Hi Kim! Thanks for hosting this fun party, I will enjoy looking at as many links as I can! Thanks so much for the feature Kim! That kitchen reno is gorgeous! Heading over to check it out! Thanks for hosting Kim. Always so many wonderful posts to read. Thanks for hosting this fun party! Nice links from last week! Beautiful ideas! Thank you for hosting! Thanks again for the feature - what an honor! Love the light in that white kitchen, hope she mentions it! Thanks for hosting Kim it's always fun! Thanks for hosting! I'm pretty new to the link parties and I'm having fun being part of them. Love your blog and style! I'm on Holiday Fun overload! Great features this week Kim. Thanks for hosting. Fabulous features ... again! I love the wall color in the first picture and the festive pillows are must haves! Thanks for hosting ... it's going to take me all day to "take in" all of the fabulous link ups! So many great features. Can't wait to go check them out. Thanks for hosting! What wonderful features Kim! Thanks for hosting this party each week. It is always a joy. Sooo many great ideas and creative thoughts out there...thanks for delivering them to us at Savvy Southern Style. I always look forward to Wednesdays, thanks to you. I am having a problem linking up. I am not at all sure how to do it. I put in my blog address my name and email but when I chose a picture it said not a direct link? I just discovered your blog. I'm a new follower! Thanks for hosting this party, Kim! So many great ideas! Kim, your features are gorgeous!! I shared a Parga beef sliders recipe and a moist and delicious fruit cake recipe today. Thank you for hosting us again and have a great week! It looks like there is a great party going on today! I'm going to visit a few of these links! Hi Kim, I am a little late but I still wanted to post my Coastal tablescape. Thanks again for hosting. Wow, look at all the wonderful decorations...lots of inspiration! Thanks for hosting! I want everything I see, or at least I want to visit everyone's homes to see things in person! Such wonderful posts! Thank you so much for hosting the linky party each week. I look forward to exploring all the wonderful goodies! Happy Holidays!